I made brownies for the first time in months tonight. My kids ate almost the entire batch in just a couple of hours. They were really good for gluten free brownies, probably the best I have made since I started baking gluten free. I normally would have allowed my kids to only eat one or two, but they have been very good this week. The weather has been hot and we have been spending a lot time in our front yard. Today I pulled out the super soakers for the first time this summer. They had so much fun running around playing in the water. It made me miss being young! Since it has been so hot I have been trying to keep my time in the kitchen to a minimum. The idea of spending hours with the oven on just isn't appealing when the weather is in the 90's with high humidity. This week I tried a new recipe for 40 Minute Red Lentil Curry from allrecipes.com. This recipe has 13 ingredients. It takes 40 minutes of total time, 10 minutes of which is active and makes 8 servings. I did make a few changes to the original recipe. First I wasn't able to find curry paste, so I made my own. I thought that I had turmeric when I started this recipe, but it turned out that I didn't so I left it out. I allowed the lentils to cook for 25 minutes, I like my red lentils to be pretty soft in curry. Finally, after all the ingredients were added I cooked the curry an additional 5 minutes. The flavor on this curry is pretty mild. If your family likes the flavor of Indian food, but aren't fans of a lot of heat this recipe would be perfect. My husband and I added cayenne pepper to our servings to increase the heat. We both prefer our food to be a little spicier than the recipe as written. 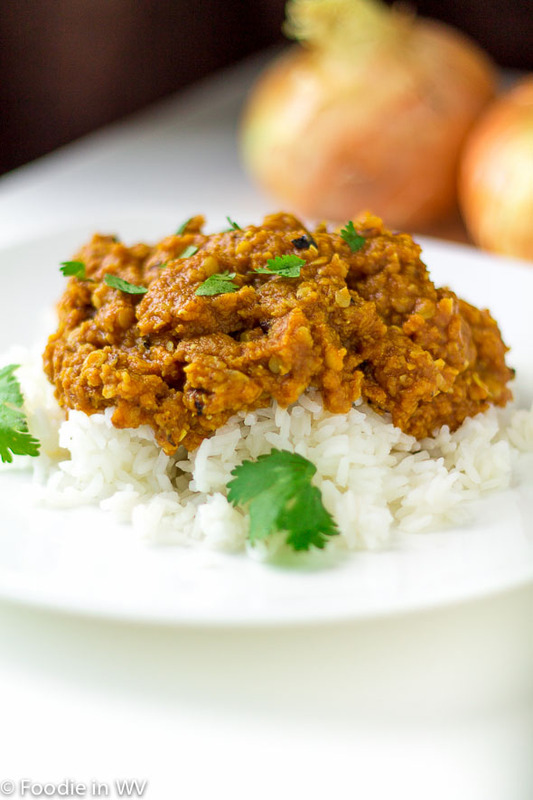 I served the curry over basmati rice and my kids really liked it. The recipe is a nice way to get kids to eat a larger variety of foods without having them turn up their noses. For the recipe go to Red Lentil Curry. Yum, looks so yummy and good for winter! Will have to go to the shops and get all the ingredients. It would be great for winter. I love making lentils when the weather gets cold, they are a nice comforting food! Oooh, I forgot about our super soakers. I need to go dig those out of our garage. If you can believe it; I've never tried Indian food, but I do like spicy! This looks good :o) Thanks for stopping by my blog and leaving a comment on my 4th of July post. That's so cool your mother-in-law's birthday is on that day ;o) By the way, happy Friday and I hope you have a great weekend! Happy Friday to you too :) I know a lot of people that have never tired Indian food, so you're not alone! They are fun, my kids love them! Lentil curry is actually beyond easy. It's a nice starting point to try Indian food at home! I love lentils! Will have to try this recipe for sure. Looks like a perfect cold weather meal. Curry has such great flavor and I love the smell! I love the smell too! I have never had curry but it is on my list of "to try" foods. It looks good! It really is good and easy to make at home! Going gluten free can take a while to adjust to. It's takes about a month not to crave bread and pasta. Also stay away from the corn based gluten free pastas, they are not good! The ones with brown rice flour are decent though and a nice substitute. My biggest advice is to cook with almond flour or coconut flour, they both work very well in gluten free baking. I love curry and this looks amazing! I think I'm too scared to try making it on my own though. Kudos to you! Looks delicous AND I already have the ingredients....i may be making this for lunch tomorrow!